cero®―absolute architectural minimalism at its best―questions conventional boundaries. With cero, architectural design can be stripped down to its most essential elements allowing for light, form, material, space, and nature to speak for itself. Outside and inside become one. The minimal framed large panel sliding glass wall by NanaWall Systems. Simple in form yet engineered to perfection. 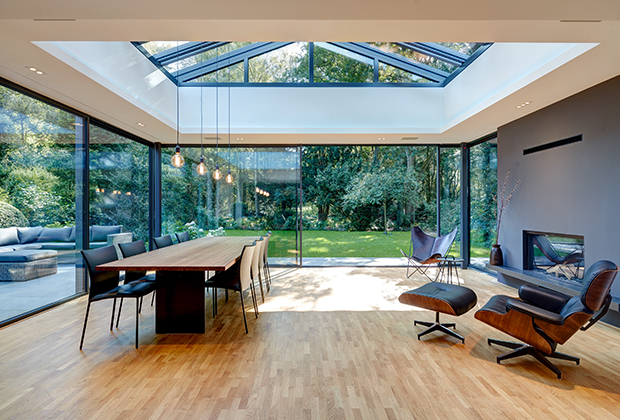 Producing clean, uniform, and ultra-thin lines for maximum light filled spaces that connect the interior to the exterior. With cero, the panel’s rail and stiles are uniform with a consistent 1 5/16” (34 mm) top to bottom, achieving a symmetrical and minimal design. NanaWall’s intelligent approach and innovative use of materials reflects a creative integration of design and technology. Within each system component is the NanaWall DNA—components designed by NanaWall and crafted with exceptional quality that perform effortlessly while standing the test of time. Floor supported cero panels are operated by carriers containing a pair of wheels with encapsulated and self-lubricating ball bearings. Unique to cero is a Gothic arch wheel bearing design. With a 2 point contact of each wheel to the bottom track, the system glides with less friction. cero's stainless steel wheels slide with ease on a stainless steel track. To maintain the sleek minimal look, each carrier is concealed within the bottom panel profile. cero has been tested to 40,000 opening and closing cycles. Double sided brushes, located in front of each roller, remove debris from the track to contribute to a smooth running system. The system interlock design of 4 layers of soft gaskets allows for a soft closing of the panels. Transparent bumpers on the top and bottom vertical stile allow for a soft opening process. cero’s panel and interlock design is engineered to accommodate panel and glass deflection with a built-in tolerance of up to 1/4” (7 mm). 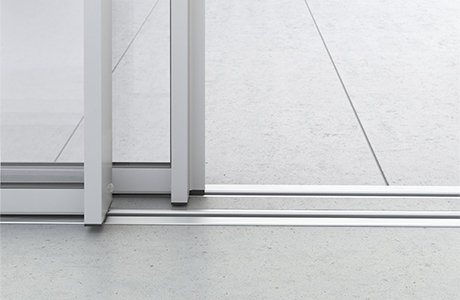 This design also eliminates the concern of the metal vertical stiles touching the adjacent glass sliding panel during the opening and closing process. 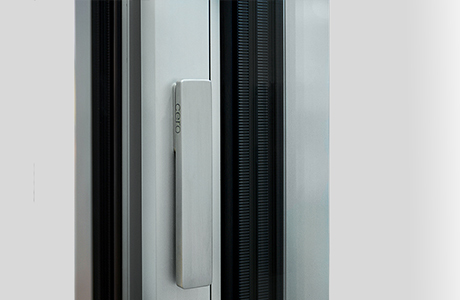 With cero, security is provided with multipoint locking and a flat handle that is integrated into the 1 5/16” (34 mm) vertical profile stile to maintain the clean, minimal appearance. A full 1” (25 mm) throw securely locks the panel into a top and bottom adjustable locking receiver. For those with higher security concerns, the system is able to meet the optional European security standards of either RC2 or RC3. 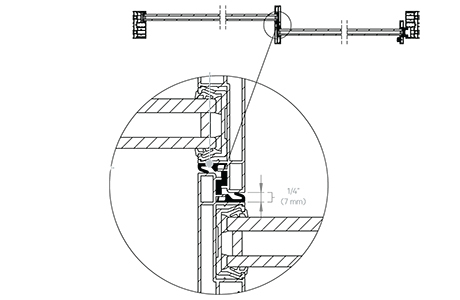 To compensate for potential future building movement, cero’s thermally broken Higher Weather Performance Sill offers height adjustability of up to 1/8” (3 mm). cero’s Higher Weather Performance Sill is fully recessed into the floor creating a clean uninterrupted transition from interior to exterior. An optional track insert is available to meet ADA requirements. Track drainage provided by an engineered, cascading water management system. For installations requiring even greater drainage due to exposure, a matching French drain system is available. 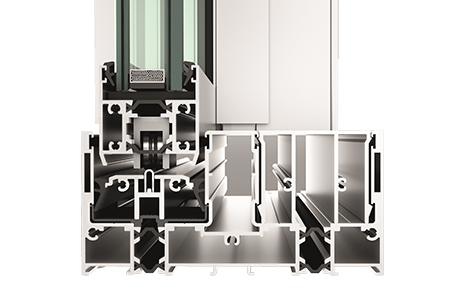 cero's Higher Weather Performance Sill is thermally broken. 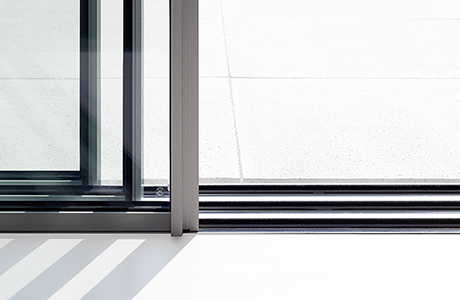 The Flush Sill option for cero II is available for sheltered or interior environments creating aesthetically seamless transitions between spaces. Finished flooring inserts can be easily installed in between the tracks making these sills virtually disappear. Sill design also makes for easy cleaning and maintenance. For commercial environments, such as retail, hotels, and auto dealerships, the Flush Sill meets ADA requirements.